* I was NOT compensated to mention any of the companies/products mentioned in this post. All opinions are my own. I’m not quite sure when it happened, but at some point my baby became a full-fledged, card-carrying, overly-verbose toddler. It didn’t happen overnight, but damn, it sure feels like it! I am now the mother of a 17 month-old with an ever increasing vocabulary, chalk-full of gems like “Boogie”, complete with gesticulating finger (as if I didn’t know where boogies came from), “Boobie/Milkie”, usually combined with a a tugging at my shirt (but sometimes with him looking pointedly and tugging at his pop-pop or daddy’s shirt- I sense an A&P lesson in the works), “Clock” and “George.” There are times when I honestly don’t know where he’s picked-up certain words, and I have a brief stomach-turning moment when I realize that I really must do something about my truck driver mouth (I don’t know why, but I developed it while pregnant with him), lest Declan randomly start dropping ‘S’ or ‘F’ bombs. This language explosion is representative of Declan’s quickly developing brain and ever-increasing independent spirit. I can see it now: Declan will soon be able to verbalize a reason countering my [currently overused] word, “No.” Right now, however, it’s Declan’s hands and body that are defiant. You’re probably scratching your head at that one [or totally understand where I’m coming from], so let me explain. Declan just can’t stop himself, from climbing furniture, from touching everything, from seeing reprimands as encouragement to do it more [faster, more dangerously, etc.]. Thank goodness my kiddo has a guardian angel; just last week he was trying to grab something from a side table, while standing on the couch (a BIG no-no), when I came back into the room [after a 1.75 minute absence]. Declan threw himself away from the incriminating evidence (him reaching for the remote), launching himself in the air sideways, off and away from the couch. Lucky for the mischievous bugger, we have an oversized stuffed ottoman/coffee table that I had pushed closer to the couch. Declan bounced off of the soft ottoman and landed on the floor between the couch and ottoman. Luckier still, there happened to be a throw on the hardwood floor to cushion his landing. I’m telling you, I don’t know if my heart can withstand a.) toddlerhood, and b.) having a boy. 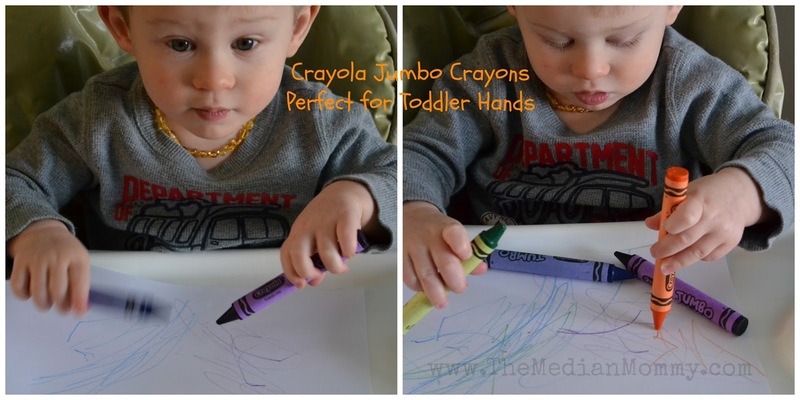 Thank you Crayola. Your Jumbo crayons and paper have provided [at least 10 minutes of] enjoyment and pride in achievement for D. *Be sure to supervise because those vibrant crayon colors look tasty to a toddler. Thank you Play-Doh. 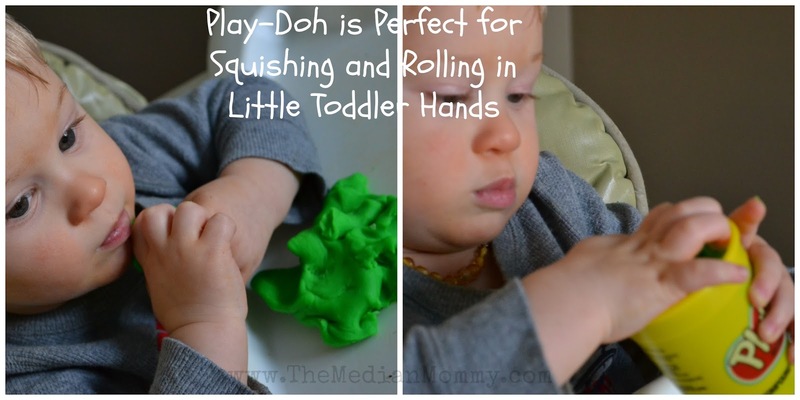 Play-Doh has been the more successful activity, and occupies D the longest, as he squishes, pulls apart, flattens, smells, licks [and eats] this colorful concoction. You can make your own, but I was in need of a quick-fix when I picked up some containers (read: desperation). *Again, be sure the supervise because those little pies that tiny hands make are apparently as appealing to a toddler’s stomach as a real one. Thank you Fisher-Price for your Doodle Pro Travel. 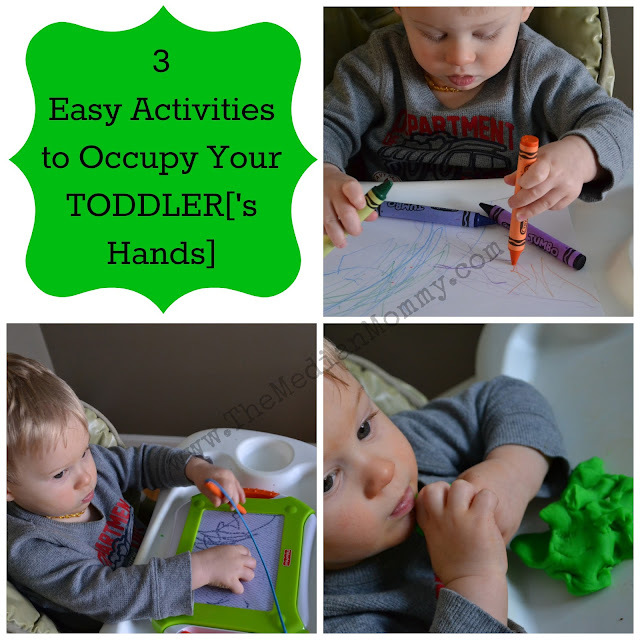 We picked this awesome toy up at an OT’s recommendation (great for developing motor skills, etc. ), and we ALL play with it! 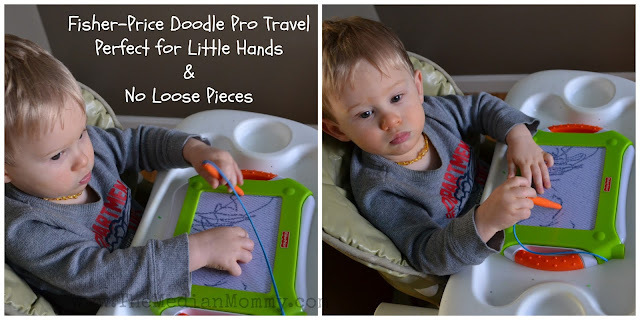 The Doodle Pro Travel is the perfect size for Toddler hands, won’t cause a mess, can’t be ingested [easily], and best of all? The Doodle Pro Travel’s magnet pen is attached with a string – no lost pieces! Three cheers all around! These are just three quick and easy items I use to occupy Declan and his compulsion to touch, pick up and feel everything. I figure that if I can give him plenty of things he is permitted to handle, he’ll stop picking up the things he’s not supposed to, right? ** As of publication, I can now add a play kitchen to the list – this involves the entire body and is providing hours of fun for Declan, as he ‘cooks’ and ‘bakes’ items for us. I love watching him lose himself in imaginative play. Santa hit the mark with the kitchen! What activities do you do to keep your toddler occupied?